Swarm’s a Brewin’: A Prediction Has Been Made! On Wednesday, Ms. Jeannie walked out her door right into a storm cloud. 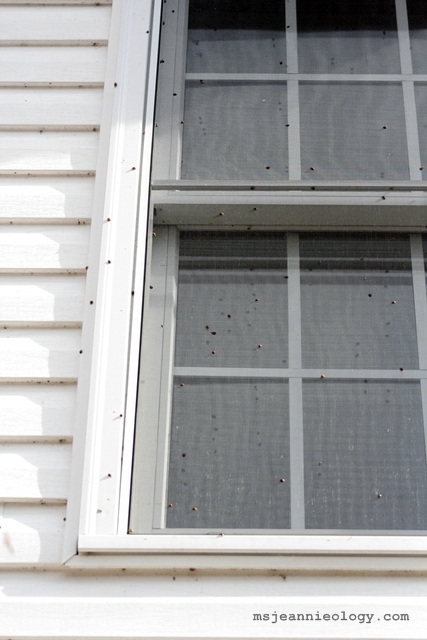 Not the fluffy white ones you see in the sky but an air combat show performed by hundreds of lady bugs. Goodness gracious – what could all this be about? Good thing the door knob on this screen door broke off last summer – otherwise I think they might have used it to come on in! 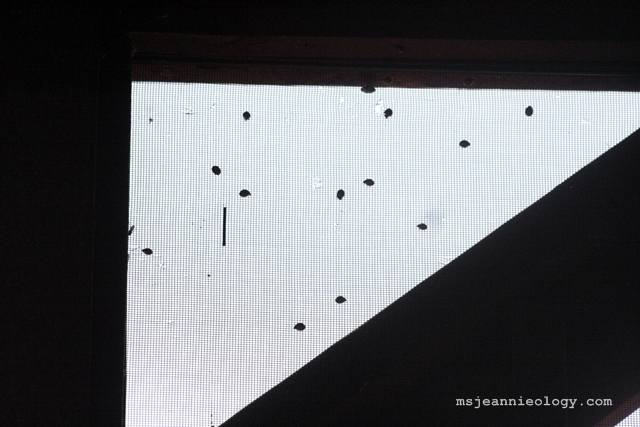 There were so many lady bugs flying through the air that it was difficult to take pictures. They’d land on the camera lens, on Ms. Jeannie’s hands and in her hair – they really were everywhere! Were they trying to take over the nest? 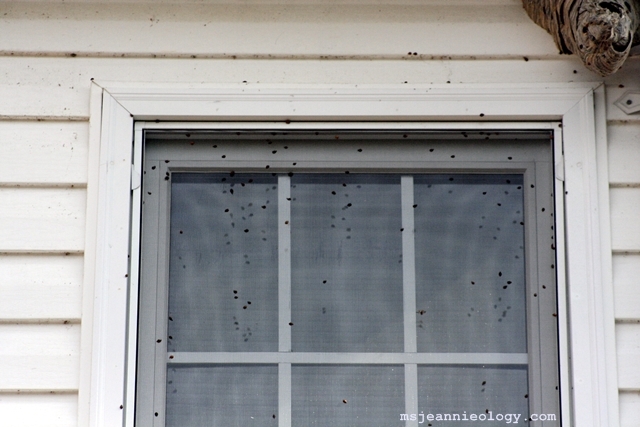 After doing a little bit of research, Ms. Jeannie discovered that lady bugs were swarming all over Northeast Georgia on Wednesday. It was nice to know that she wasn’t alone in this matter! 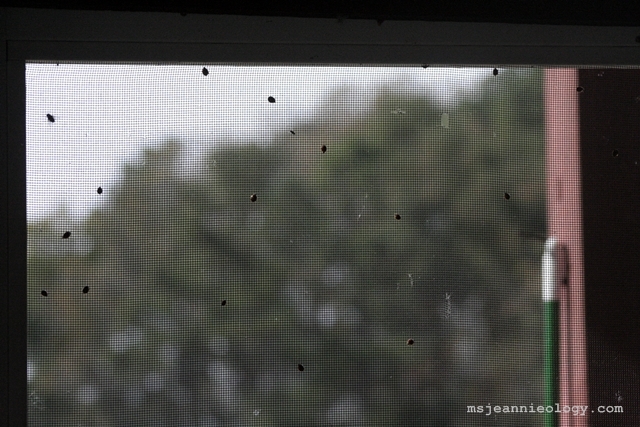 Apparently, the lady bugs chose a balmy 75 degree day to move in. 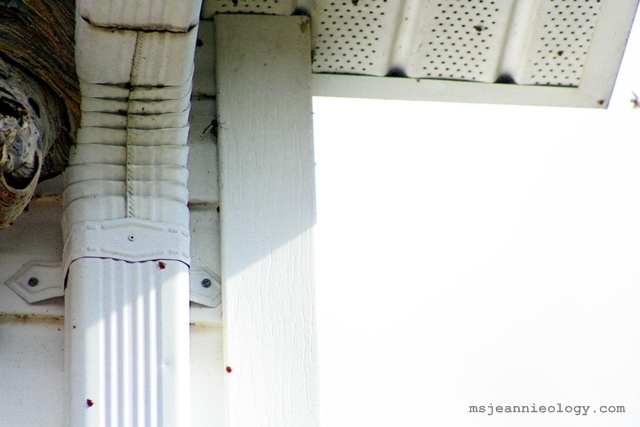 Not to the hornet’s nest though – they wanted to move in with Ms. Jeannie! 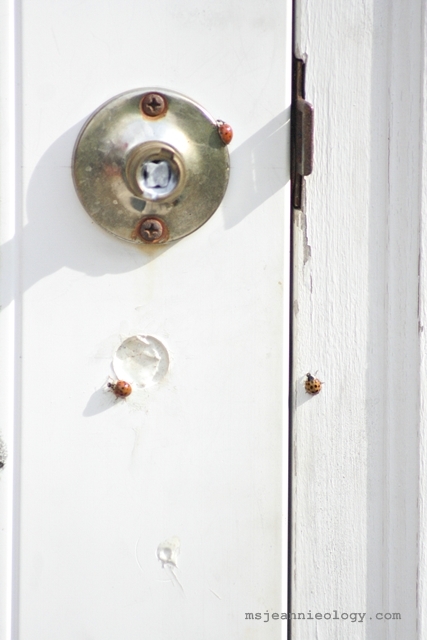 According to nature folklore, lady bugs are little weather predictors for the coming season. And when they arrive by the hundreds that is your warning to batten down the hatches because it is going to be a cold winter. 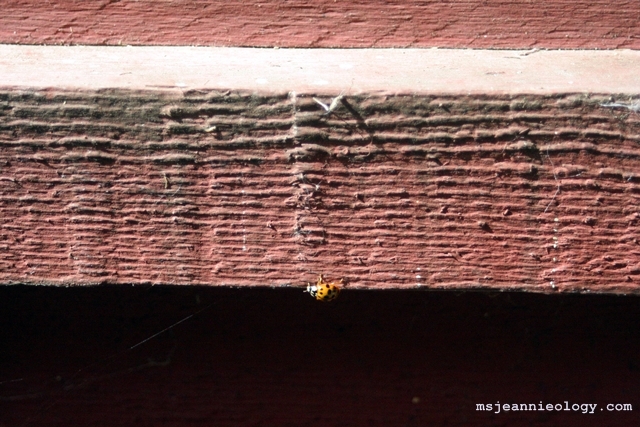 The lady bugs in ms. Jeannie’s neighborhood were out real estate shopping for a warm and cozy winter home! All this makes sense, but it is curious as to why they chose Wednesday for their invasion, and even more curious as to why it was only a one day affair, particularly since the weather has been warm all week. On Thursday there was no sign of them anywhere – not even a few stragglers. And since everything is sealed up on that side of the house, (hopefully!) Ms. Jeannie wonders where they all went. Perhaps they did move in with the hornets. Ms. Jeannie will keep her eye out and keep you posted. In the meantime, she hopes everyone had a great Halloween. She was late wishing you a happy holiday yesterday, but luckily she got her pumpkin carved in time for trick or treaters last night. This year she went with an owl theme. It was also the first time she tried her hand at a relief style carving. 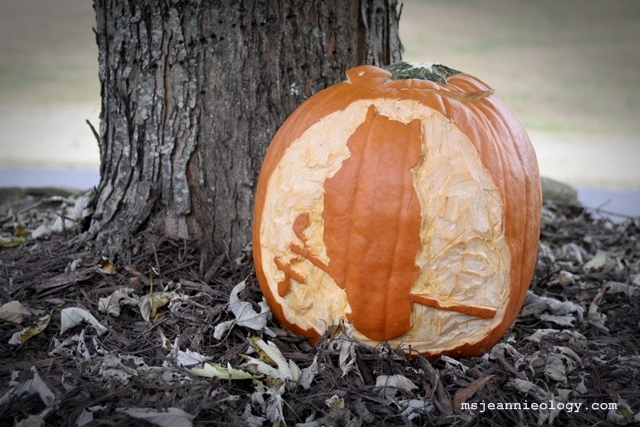 Hope you had a spook-tacular day! Oh! That means there on their way to Virginia. Amazing, and thousands of them. Truly Ms. Jeannie…you have the most interesting adventures!